So you have a flea problem. You are not alone. The fact is fleas invade millions of homes every year. The conditions are right in an enormous number of homes. 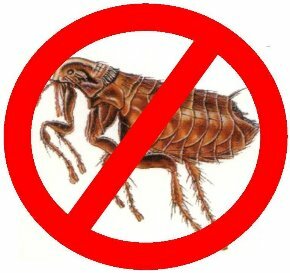 Quite simply, if you have central heating, carpet, throw rugs, and a pet, your home has the potential for flea infestations. Because they provide the three essentials for flea life, heat, shelter, and food. There is a professional way to control fleas. It involves an understanding of fleas and their habits, as well as a prevention program involving both you and the most knowledgeable help you’ve got – your professional service technician from InspectorUSA Termite and Pest Control. As part of our Problem Solver Services, InspectorUSA offers a three stage treatment plan that includes a role for you to play and a role for InspectorUSA. We cannot solve you flea problem unless you participate. This treatment plan will provide you with simple guidelines that will make your flea problem a thing of the past. Before treatment can be completed your home must be prepared. A thorough cleaning of the home is your first order of business. This is a very important preparatory measure and should not be taken lightly. Start by taking all pet bedding and washing it thoroughly in hot water, or destroy it. Next, vacuum all carpeting and mop all wood and tile floors. It is particularly important to clean thoroughly in areas where pets sleep or rest also clean under furniture, in cracks and crevices and along walls. Don’t forget closets too. And remember, you can’t always see fleas – particularly eggs and larvae – so be thorough. It’s also important to clean or vacuum furniture – particularly between and under cushions, a favorite hiding place for flea larvae. After vacuuming, empty contents of vacuum cleaner into an air-tight plastic bag. Immediately dispose of bag outdoors or burn it. All affected pets should be treated by a veterinarian. Your InspectorUSA technician will not treat your pets. It’s also necessary to remove pets from the home during treatment – including birds. Fish bowls and aquariums can remain as long as they are properly covered. All floors – including closet floor – should be cleaned of boxes and other items so that the InspectorUSA technician will have ready access to entire floor surfaces. The InspectorUSA technician will be using a general use insecticide that’s low on the toxicity scale, and safe when applied by professionals. But like any insecticide, it must be treated with respect. That’s why it’s necessary for all people and pets to be out of the house while the treatment is being done. It makes for a safe application. Since it’s important not to disturb the insecticide until it has completely dried, it makes for a more effective one as well. As a result, your technician will ask that you do not enter your home until four hours after the application. Once he has checked to see that the necessary items in your home have been removed, or covered, he will begin the treatment. He will apply a fine broadcast spray over all infected areas – carpets, rugs, wood and tile flooring, baseboards, pet bedding and resting areas, and in the cracks and crevices in the furniture. The insecticide won’t stain, so don’t worry about your carpets or upholstery. It has only a slight odor that will soon vanish completely. As noted earlier, it’s necessary for people and pets to be out of the house until the insecticide has dried thoroughly. That’s normally two to four hours. When you do re-enter your house, you can resume all your normal activities with one exception, you should put off cleaning carpets, floors and treated furniture with detergents or cleansers as long as possible. Vacuuming, however, is OK since the insecticide will tightly bind to carpeting. A quick biology lesson will explain why it’s important not to clean with detergents. You see, the fleas have a four-stage life cycle – egg, larvae, pupa, and adult. An insecticide will affect fleas only in two of these stages – the mobile larvae and adult stages. So the insecticide must be left undisturbed until the fleas grow from egg to larvae or from pupa into adulthood. Since the insecticide does have this delayed effect on emerging fleas, you may notice some flea activity after the treatment. this does not mean that the insecticide isn’t working – it may take up to 24 to 48 hours before all activity ceases, so be patient. If after a week or so you are still experencing problems contact us because as a Problem Solver Service your additional service needs are FREE! With your cooperation we as a team can solve your flea problem and you can enjoy a pest free home.